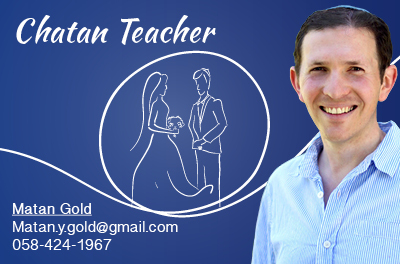 Established in 1977, Eddie’s Kosher Travel is one of the most respected travel agencies in the Jewish world. 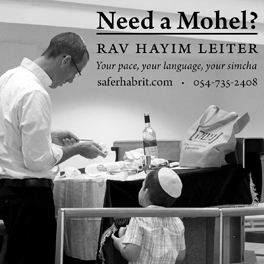 For over three decades, our goal has to been to provide the kosher traveler with a full range of exciting travel option while ensuring the highest level of Kashrut. We have been operating exciting Passover hotel programs for decades, and offer the full range of Kosher Deluxe Cruises and Exotic Land Tours to the discerning observant Jewish traveler in search of an enriching, unforgettable experience, world-class kosher cuisine, and unparalleled personal service. 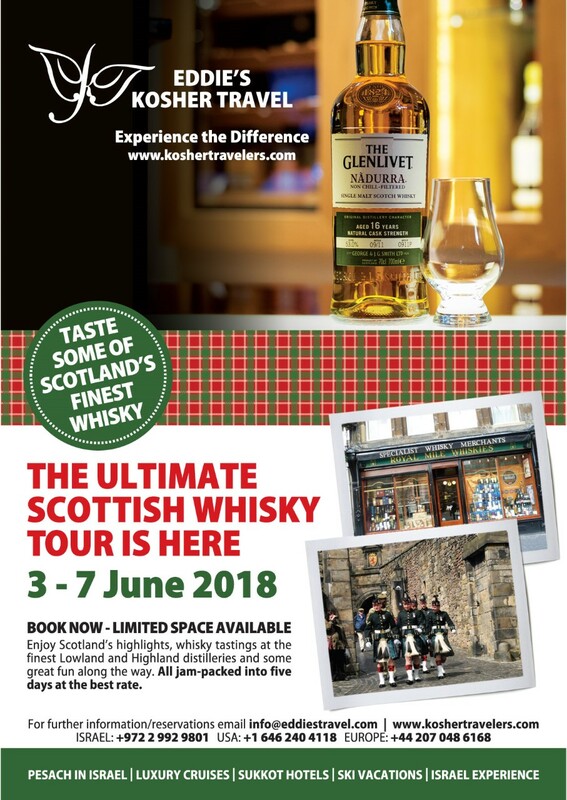 This Kosher Whiskey Tour in Scotland is an enjoyable and healthy vacation and an exquisite way of sampling top quality whisky, whilst meeting really interesting people. The trip includes sightseeing several well known locations, including Sterling Castle, the National Wallace Monument, the Scottish Parliament and taking bus tours. 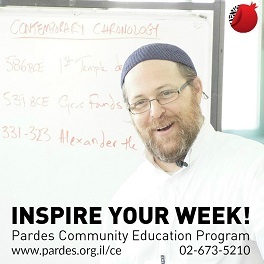 You will also get a chance to learn about the Jewish community and visit Synagogues. 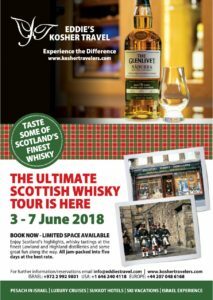 Enjoy Scotland’s highlights, whiskey tastings at the finest Lowland and Highland distilleries and some great fun along the way. All jam-packed into 5 days at the best rates. The tour is open to couples, father/sons and good mates willing to share on a twin basis. Click on here for more details of the Whiskey Tour. 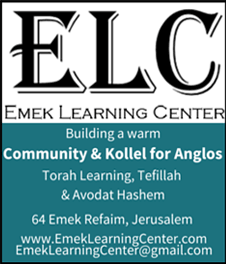 See the flyer below for more info – Click on it to enlarge.